A total of fifteen football helmets earned five stars in the latest Virginia Tech Helmet Ratings,TM a test of helmets in a laboratory environment intended to measure their effectiveness in reducing the forces that cause concussion. Schutt's AiR XP Pro VTDII and the Vengeance VTD II continue to top the list of five-star helmets (awarded to helmets Virginia Tech considers the "best available" ), two from Riddell (the Speedflex and 360), three by Xenith (Epic, , X2, X2E), two from Rawlings (the Quantum Plus and Tachyon), and two from SG (Version 2.0 and 2.5)(although consumers were advised to monitor padding of the SG helmets throughout the season because of permanent cracks in the padding observed for all tested SG helmets, reminded that the two year lifespan of the SG helmets was much shorter than the 10-year lifespan for most other helmets, and that the sizing of the SG helmets was unique, so careful measuring of head size was required). Nine helmets were rated 4 stars (classified by Virginia as "very good"): three by Schutt, two by Riddell and Rawlings, one by Xenith, and one by SG. As in prior years, Schutt continues to hold down all three spots in the 3-star (good) category with its Air XP, DNA-Pro+ (which inexplicably dropped from 4-stars to 3 in 2013; see NOCSAE's "concern" about this change below), and the Air XP Ultralite. Virginia Tech's current evaluation process involves performing 120 impact tests on each helmet model at multiple locations and impact energies utilizing the STAR (Summation of Tests for the Analysis of Risk) Evaluation System, which it developed based on data collected from over 1.8-million head impacts experienced by football players over an eight-year period. According to Virginia Tech, the STAR value is an estimate of the number of concussions that one collegiate player might experience over the course of a season wearing a specific helmet. The lower the STAR value, the better the helmet is believed by Virginia Tech to be in reducing the risk of concussion. "We recommend any of the four or five star helmets for players. The specific helmet a player chooses will be dependent on other factors such as a fit and comfort," said project director Stefan Duma, the Harry C. Wyatt Professor of Engineering and department head of the Virginia Tech -- Wake Forest School of Biomedical Engineering and Sciences. Ratings currently based only on linear acceleration: Because the current STAR values are based solely on linear (i.e. straight-line) acceleration and do not reflect rotational (i.e. twisting) acceleration, Virginia Tech's rating methodology has come under heavy criticism in recent years by the National Operating Committee on Standards for Athletic Equipment (NOCSAE). Responding to the NOCSAE criticism, Virginia Tech continues to promise that its ratings would take into account rotational (e.g. twisting) acceleration as well, based on a research paper published in 2013, but, as of September 2016, they do still do not. As promised new helmets were added to the STAR ratings in May 2014. STAR ratings for hockey helmets are slated to be published in fall 2014, which will be the first to incorporate the new methodology including rotational acceleration, according to Duma. [Duma confirmed in a July 2014 article in the New York Times  that hockey helmet ratings would be issued in the fall or winter of 2014]. STAR ratings using the new methodology for football helmets, however, will not be issued until 2015, he told MomsTEAM. The release by Virginia Tech of its 2014 STAR ratings was met with continued criticism from NOCSAE. Although applauding and encouraging the growing research in the area of concussion protection for athletes, NOCSAE was once again quick to caution coaches, consumers, and parents that scientific evidence "does not support [Virginia Tech's] claim that a particular helmet brand or model is more effective in reducing the occurrence of concussive events," to point out, as it had in 2013, that the STAR ratings approached the very broad and complex issue of concussion protection from a narrow vantage point of linear accelerations only, and to again remind consumers that the ratings only applied to size large adult helmets. NOCSAE's longtime Executive Director, Mike Oliver, noted that the STAR ratings were "not standards." Rather, he said, they were a "theoretical method of comparing one helmet against another," and claimed that "many have misunderstood the purpose and limitations of the STAR ratings. 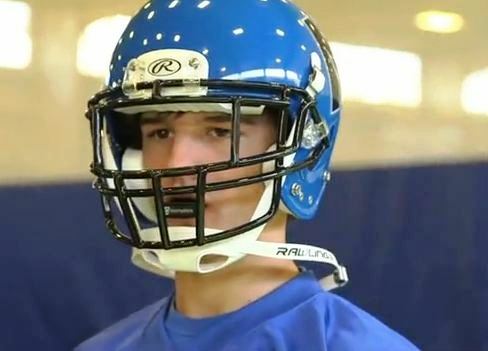 A 5-STAR rating does not mean," Oliver said, "that the helmet is great at preventing concussions. It simply means that it might be better than another helmet with a lower rating." Oliver went on to claim in the NOCSAE statement that, because of this alleged misunderstanding, the effectiveness of helmets in protecting against concussions has become "exaggerated," taking focus away from steps he said were known to have a more immediate and much greater effect on concussion reduction, such as making sure equipment fits properly, ensuring that young athletes are taught proper blocking and tackling techniques and demanding enforcement of rules that prohibit players from leading with their helmets to hit other players (all of which, it should be noted, are emphasized by MomsTEAM in the Six Pillar approach to concussion risk management featured in its PBS documentary, "The Smartest Team: Making High School Football Safer," and for which we have been advocating for many years). Values should be used for comparative purposes only: The STAR value is based on injury probability and should not be interpreted as a literal number of injuries for any one athlete. Wearing a highly rated helmet will not prevent a player from sustaining a concussion. The Virginia Tech researchers concede that any player can sustain a head injury even with the very best protection, that a "specific person's risk of concussion may vary as a result of a number of factors" having nothing to do with the helmets, including genetic differences (some athletes may be genetically predisposed to concussion), age, health history (e.g. history of migraines,	depression or other mental health disorders, attention deficit	hyperactivity disorder, learning disabilities, sleep disorders, and/or previous history of concussion), impact factors (e.g. neck muscle strength/weight), style of play, etc.